(Yellow Avens (Geum Aleppicum) - 01) The yellow avens is a summer blooming wildflower (June - August) that grows to a height of from one to five feet. The taller ones seem to be in locations where they are competing for sunlight. 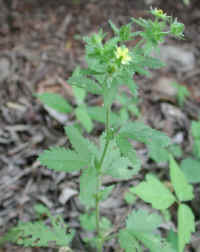 Yellow avens usually are found in thickets and moist meadows, and north of a line from New Jersey to Illinois. (Yellow Avens (Geum Aleppicum) - 01a) The leaves of the yellow avens are pinnate with as many as nine toothed leaflets (according to the literature). 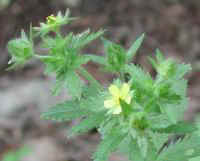 The yellow avens we have seen have three leaflets. 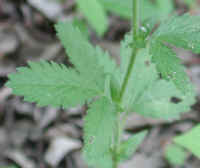 These leaves alternate on the stalk and sometimes have smaller solitary leaves, as pictured here. (Yellow Avens (Geum Aleppicum) - 01b) The top of the yellow avens stalk branches, with a solitary flower developing at the end of each branch. (Yellow Avens (Geum Aleppicum) - 02) The actual size of the yellow avens flower is one inch in diameter. 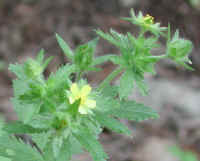 The yellow avens flower has five petals which, in this photo, are just beginning to unfold; and when fully developed, are all yellow. 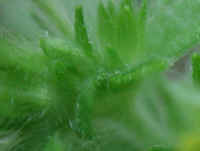 The numerous stamens and pistils are not developed enough to properly be seen in this photo. 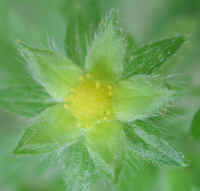 (Yellow Avens (Geum Aleppicum) - 03) This is an enlargement of a developing bud of the yellow avens. (Yellow Avens (Geum Aleppicum) - 03a) This is an enlargement of one of the fully developed petals of the yellow avens.